Our Matcha Green Tea is of the first harvest and shade-grown. It’s a potent antioxidant, boosts energy, burns fat, and enhances mood. 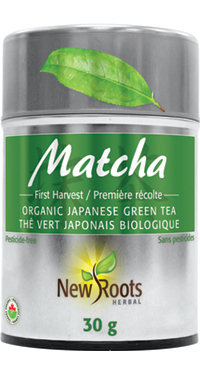 New Roots Herbal’s Matcha Green Tea is shade-grown and hand-harvested. Unlike traditional green tea, its luminous green colour as well as its creamy taste and texture are the result of a subtle steaming of the entire leaf prior to being stone-ground. It’s never roasted, fermented, or pan-seared. Its potent antioxidant and chemoprotective properties are attributed to its high level of the polyphenol epigallocatechin gallate (EGCG). ECGC is also credited with its positive effects on collagen, the specific protein responsible for healthy connective tissue as well as succulent, supple, and radiant skin. Our Matcha Green Tea is also rich in naturally occurring ʟ‑theanine, the amino acid which relaxes the spirit and sharpens mental clarity. Preparation: Mix ¼–½ teaspoon per 150 ml cup of hot water. Adjust to taste. Pure organic premium matcha green tea (Camellia sinensis).